Once upon a time, wedding cakes were a one size fits all affair – that is to say, dried fruit and white fondant were the order of the day. That was – of course – pre-Instagram. As our cake creations have become increasingly elaborate, they are taking a bigger bite out of the bridal budget. But as we’re sure your inner sweet tooth will assert, it’s a worthy cause, with their painstaking design details an opportunity to stamp one’s personality on the big day, as much as the wedding dress itself. If you’re looking to make a statement at your dessert table, it seems 2018 is living up to the culinary hype. We have hunted out the wedding cake trends 2018/2019 couples will totally adore. We’ve long been seduced by the culinary cool cred of the edible flower trend to add flavour to salads and soups. Now our clever cake makers are having a dalliance with decorating of the floral kind and it’s got our mouths watering. Brushstroke cakes are currently trending in a big way. These art-inspired creations consist of melting chocolate onto wax paper and using a paintbrush to create ‘feathers’ which are placed on a cake once they harden. The beauty is in the simplicity of this tasty trend. All dressed in black, she may appear dark and moody at face value, but like the LBD, is actually chic and understated, especially when brought to life with several textured tiers. This romantic trend is right at home with a spring wedding. A new take on the watercolour trend of recent years, hand-painted floral details are one of the prettiest wedding cake trends of the year. Gold leaf is being added to fondant or buttercream frosting to create a gilded finish. Strategic scattering gives a rustic shimmer or cover one or two tiers to truly dazzle your guests. Many brides to be are going back to basics, with simple buttercream cakes featuring one fruity flavour – figs. Though fruit wedding cakes are not new by any stretch, figs are the fruit of the moment. Expect to see these dark purple fruits dotting wedding cakes throughout 2018. 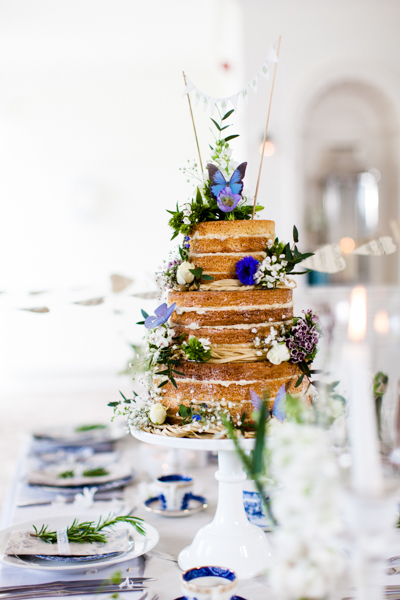 The so-called ‘naked cake’ – which boasts little to no frosting – is the shabby chic of the cake world; a little rustic but oh so glam and its popularity shows no sign of abating in 2018. The most clever of our culinary creators have been taking clear isomalt – a sugar substitute – and colouring and shaping it to create a stained-glass effect.